A secret agent aboard a galactic railroad must derail a sinister conspiracy in this “rip-roaring” thriller by the author of Star Wars: Thrawn (Publishers Weekly). The universe is a dangerous place, a fact violently brought home to Frank Compton for perhaps the thousandth time when a stranger delivering a message dies right in front of him. An operative for Western Alliance Intelligence until his whistle-blowing activities got him fired, Compton is now being sought out by the Spiders, the robotic alien beings responsible for the upkeep and operation of the Quadrail transportation system, which connects the galaxy’s twelve inhabited empires. The discovery of a sinister plot to use the Quadrail for ill has brought the Spiders to Compton—for only someone possessing the former agent’s unique skills can stop the scheme for good. But when Compton leaves Earth behind—joining forces with Bayta, the Spiders’ beautiful, half-human representative aboard the Quadrail—the terrifying scope of a vast, galaxy-wide conspiracy begins to reveal itself. Targeted on all sides by alien assassins of every shape and species, Compton and his enigmatic new partner are suddenly in a race against a clock ticking down to an irreversible doomsday, one in which the galactic night train will derail, carrying all members of humanity screaming to their deaths. 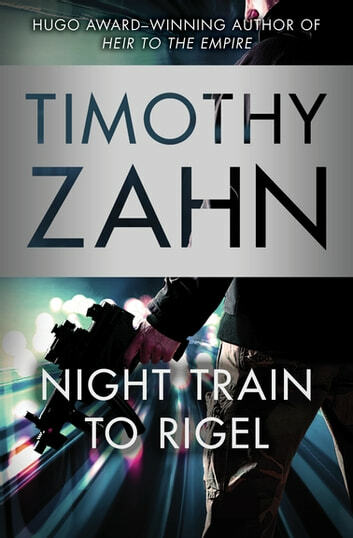 The first in the Quadrail series from the Hugo Award–winning author of Blackcollar and many New York Times–bestselling Star Wars novels, Night Train to Rigel is an action-packed “great read” (Booklist). Better get your tickets now before they're sold out. I read and finished the whole series with the hardbacks. A lot of sci-fi and fantasy. Interesting aliens, new food, a fun way to travel, nasty humans, mystery. Leave your weapons at home or they get locked up under your car. All aboard!